The Wilmington Photo Booth Company is a photo booth rental company. We service the greater Wilmington, Baltimore and Philadelphia area. Our photo booths are great for weddings, birthday & anniversary parties, class reunions, bar/bat mitzvahs, holiday parties, graduations, charitable functions, corporate events and much more! Our photo booths are designed for fun, elegance and flexibility. Adults, and kids of all ages, love our photo booths as they provide non-stop entertainment. High Quality Customized Prints are produced within seconds of each session so the smiles come quickly and often. The decor of our photo booths will fit any occasion. 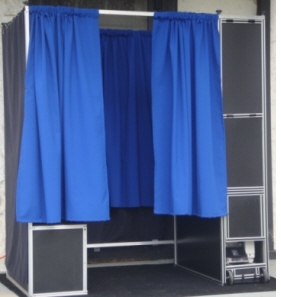 Our photo booths are completely portable and we can virtually set them up anywhere. They are light and can be set-up quickly. Of course you won't have to worry about that as each package comes with on-site delivery, set-up and breakdown, along with two on-site technicians for the duration of your event. Our photo booth has an external monitor which displays all photos taken at the event in slide show format. And in every package price we include full access to every photo and print after the event. Every guest receives an event ID and password to access the photos on our website. So whether you've already hosted an event with a photo booth or have been to an event with one or have only heard about this novel idea, you may visit our Why Rent section to find out all the benefits of renting a photo booth and why you should choose us, The Wilmington Photo Booth Company. Or you may Contact Us directly for more information. Our phone number is (302) 388-3619. Check Out Our Wedding Wire Reviews and Compare Us to the Competition. The Wilmington Photo Booth Company is dedicated to providing our clients an enhanced photo booth rental experience through unparalleled service, attention to detail and extensive knowledge. Our commitment to our clients and employees, combined with the technological advances of our products, makes us a company to rely on for years.